Be the first to share your favorite memory, photo or story of Almeta "Mickey". This memorial page is dedicated for family, friends and future generations to celebrate the life of their loved one. 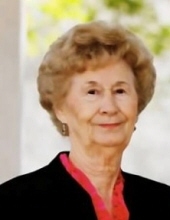 Almeta June Dyess Pate, known as “Miss Mickey”, 86, passed away Monday, January 28, 2019 surrounded by her family and under the care of Ogeechee Area Hospice. She was born in Daisy, Georgia, November 18, 1932 to Louie and Etta Kicklighter Dyess. As a military wife she lived in several states and moved to Glennville when her husband retired from the Air Force in the Late 1960’s. . She was a loving caring mother, granny, sister and aunt. She loved spending time with her family and cherished time spent with her three great-grandchildren. She enjoyed being a homemaker, baking and working in her yard and flower garden. She loved her church family and was a faithful member of Ella Grove Baptist Church. She is preceded in death by her parents and husband, Dennis Pate. Grandchildren, Danna Rogers Paul and Brad Rogers, Three Great Grandchildren, Pate and Annie Rogers and Cameron Paul, several nieces and nephews also survive. Visitation will begin at 1:30 PM, Wednesday, January 30, 2019 at Brannen Kennedy Funeral Home. Funeral Services will follow at 3:00 PM, at the Chapel of Brannen Kennedy Funeral Home with Elder Tom Horne officiating. Burial will be in Beards Creek Church Cemetery. Pallbearers: Gary Dasher, Ken Rogers, Mark Brewton, Dennis Stanfield, Kenny Long, Steve Rush. Family wants a special thank you to; Dr. Paul Thompson and his staff, caregivers, Lilian Hobbs, Mary Wilkerson, Sally Burkhalter, Ruth Ann Foster and Ogeechee Area Hospice and Staff of Statesboro. Brannnen Kennedy Funeral Home of Glennville is in charge of the arrangements. To send flowers or a remembrance gift to the family of Almeta "Mickey" June Dyess Pate, please visit our Tribute Store. "Email Address" would like to share the life celebration of Almeta "Mickey" June Dyess Pate. Click on the "link" to go to share a favorite memory or leave a condolence message for the family.